The first thing you try is the console https://rimuhosting.com/cp/vps/console.jsp . Add your key or setup a password and then ssh into the host it gives you to see if you actually have this problem. Then this is the current bug, and the good thing is, its a very easy fix involving just the kernel upgrade. Look for where it shows your kernel and a 'Change' button. Click the Change button which brings you to a page like this. Now select the latest kernel, then click the "Change Kernel" button. In this screenshot the latest kernel is 2.6.30.5-xenU.i386. This will reboot your VPS with the latest kernel. Update: We had one customer whom seemed to continue having problems, the fix was to just to disable /dev/pts and /sys mounts in /etc/fstab. 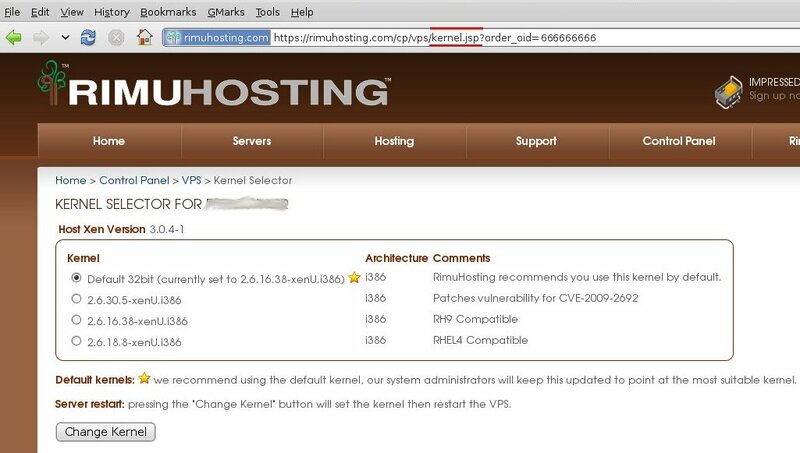 This entry was posted in Rimuhosting and tagged 9.10, karmic, kernel, koala, ubuntu, update, upgrade, vps, xen. Bookmark the permalink. One Response to Upgrading to Karmic Koala ? VPS broken? Heres the fix!